The above are a group of very large display boards which once graced the walls of the Abbots Bromley Puppet Museum. The marionettes are by Harry Tozer of Barcelona, who also took the photographs. Harry Tozer was born at Villa Rica, Paraguay on 9th November 1902. His parents were British and at ten years of age, Harry returned to England to be educated. It was at this time that he saw his first Punch & Judy Show and at the age of 15, he made his first set of Punch & Judy figures. In 1927, a period of ill health resulted in him spending a whole year under treatment in England. While recovering, he was inspired by Walter Wilkinson's book "The Peep Show" to carve another much-improved set of Punch figures. 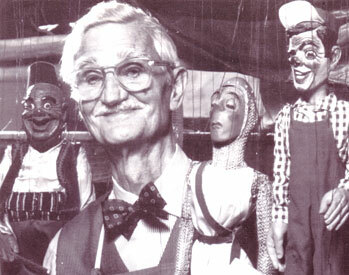 He constructed his first marionettes in 1934 and had completed 9 figures before the Spanish Civil War broke out in 1936. He made another 5 figures during the first few months of the Civil War and his first marionette shows were to entertain war refugees. The outbreak of World War II, immediately after the Civil War, made it difficult to develop his marionette theatre, but a permanent stage was built in Barcelona and further puppets gradually added until, by the beginning of 1944, his marionette shows had begun to attract attention as there was nothing else like them in the whole of Spain. In February 1946, the marionette group had swelled to 8 puppeteers and after months of rehearsal, a series of 6 performances were given for the general public. These shows received excellent reviews in the press and encouraged the building of new puppets and new shows for many years to come. In 1950 and 1951, Harry Tozer began to travel abroad and during his annual vacation, worked for a month in England with the Lanchester Marionettes. He also visited marionette theatres in Zurich and Salzburg to broaden his experience. Tozer was forced to re-locate premises several times over the years, until the creation of a Puppetry Department in the Provincial Theatre Institute awoke such interest in the only marionette theatre existing in Spain, that its Director offered to transfer all Tozer's materials to the Theatre Museum. Upon opening the 17 crates, the staff were so amazed by the quantity, it was decided an exhibition was merited. The success of the exhibition prompted the Director of the Theatre Institute to offer a final home for the Marionette Theatre. Harry Tozer died at his home in Barcelona on 9th June, 1999. Writing in The Puppet Master, Stan Parker commented: "In a word, Harry was great. A lovely man and very much respected. Harry saw the best in everyone, I doubt if he had an enemy in the world. When I was last with him, he was 94 and bright as a button, full of chat as ever, keen to show me plans and photographs of his marionettes." H V Tozer was made a member of honour of UNIMA in 1985 and became a Vice President of the British Puppet & Model Theatre Guild in 1991.